As you may have heard, we’ve had to scale back operations a little bit due to lack of funding, but we’ve still got lots of fun events coming up in the next few weeks! Story Planet will be hosting two workshops at The Toronto Storytelling Festival happening on April 9 and 10! During the first storytelling workshop happening both days from 1:30-2:15pm at the Marilyn Brewer Community Space, participants will learn, develop, and perform an oral storytelling piece. 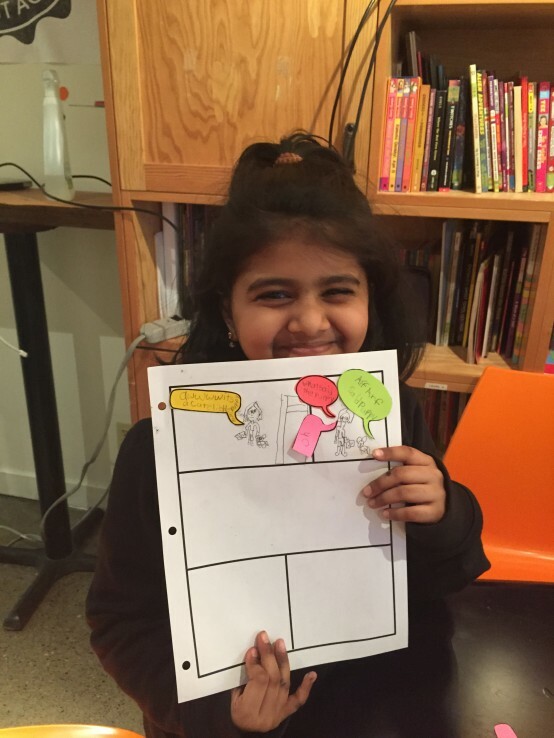 During the second Storymaker Remix workshop (on both days from 2:30-3:30pm, also at the Marilyn Brewer Community Space), kids will create one super unique story along with an artist who will be drawing along with them. Both workshops are open to all ages of students. Click here to find out more about the Toronto Storytelling Festival! On Thursday, April 7th from 10am-12pm Story Planet will be hosting a Storymaker Workshop for participants in grade 5. With the guidance of a facilitator, participants will create a story as a group and then independently write their own ending. Children can also see their story come to life through the illustrations of one of our artists! As we navigate the ups and downs of the funding landscape we have decided to look at the model we currently have and adapt it. While our social enterprise (formerly known as the ITA) has been an amazing community hub, it has not been financially viable. We have let the espresso machine go and are operating it, for the next little while, as a pay-what-you-can, serve-yourself community lounge. We’ve been surprised by the incredibly warm reception to this slightly kooky idea! Lift Off, our after school program, continues through to the end of this term, April 14th. Storymakers will continue as funding allows. We will decide at the end of April whether to keep the doors to the space open, or move to a more nimble operation where we continue to do workshops in schools and community centres but not in our own space. The winds of Jupiter are blowing in an interesting way! We’ve raised almost $4,000 on GoFundMe! Thanks for your help, Story Planet supporters. We’re well on our way to reaching our goal of $10,000 to keep programs like our Lift Off After School Program free to our students. Follow this link to donate to our literacy programming. No amount is too small! Hey space explorers, we still have space in our March Break programs! On Tuesday, March 15th from 10 a.m.-4 p.m., kids aged 10-13 are invited to try their hand at stop-motion animation! We’ll teach participants the basics of stop motion animation, and then they’ll gather their own materials to make a short animation of their own. At the end of the day, they’ll get to take home a USB key with their original video. Next, on Wednesday, March 16th from 10 a.m.-12 p.m., we’re hosting a Storymaker Remix for participants in grades 2-7. With the guidance of a facilitator, participants will create a story as a group and then independently write their own ending. Children can also see their story come to life through the illustrations of one of our artists! Contact noorin@storyplanet.ca to sign up for either day!